My friend Chassity over at Look Linger love did a series today called 'Styling This Art'. She asked me to style a space using her artwork as well as my own from Cocoa & Hearts. I came up with 2 living room mood boards. Below is the 1st one & other one you can check out on her blog. 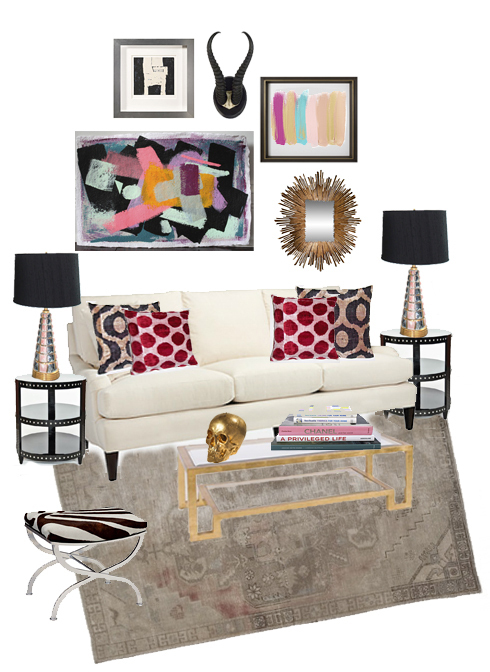 I'm NOT an interior designer, but I love decorating - this is one of the few mood boards I've done, so ta da! It's a funky & fun space, hope you like them both! So fun! All these items are adorable. Love all of these accessories and of course great art! I love it all! Very beautiful, great work, you have to become an interior designer ! I love it!! I'd be thrilled to have this fun and stylish room! Great coffee table and antlers! What a great addition to pull everything together. Completely obsessed with your space! Such fun colors and that gold coffee table- yum! laura: thank you! :) No, that piece is actually done by Chassity.. :) Pretty huh? Such a great looking living room you designed. Love the gold skull. btw, you should check out the artist Cole Sternberg, he is featured on Christian May`s Maison21 blog. I think his paintings are just your style. And his paintings are being turned into rugs, I can see the same thing happening with yours. Thought it would be interesting for you to see. Cute mood board Jen! Love that coffee table. So lovely.